How much should you have in stocks versus bonds? How about large versus small stocks? Growth versus value? Exchange-traded funds or mutual funds? Should you include alternative assets? These are all things that tend to dominate the financial headlines and are the focus of much research, inquiry, and consternation on the part of investors. But the reality is these are all details. Important details, certainly. Details we help our clients address. But not the most important consideration when investing. A recent survey by the world's largest money management firm, Blackrock, found that responding investors still had 58% of their portfolios sitting in cash, still wounded from the 2008 bear market. 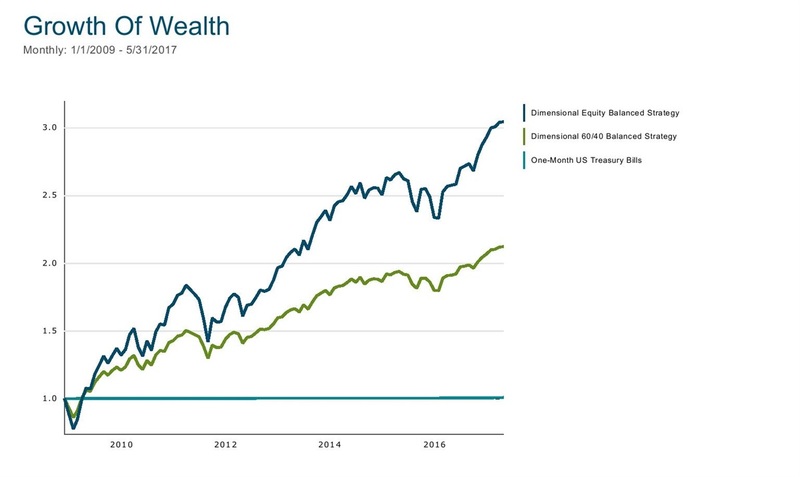 The graph below shows the cumulative returns on an all-stock portfolio, a 60/40 balanced portfolio, and one-month t-bills (cash). The cost of letting fear drive investment decisions has been exceptional over the last 8 1/2 years. Be thankful you have an investment plan and you're sticking to it. Most others aren't as fortunate.